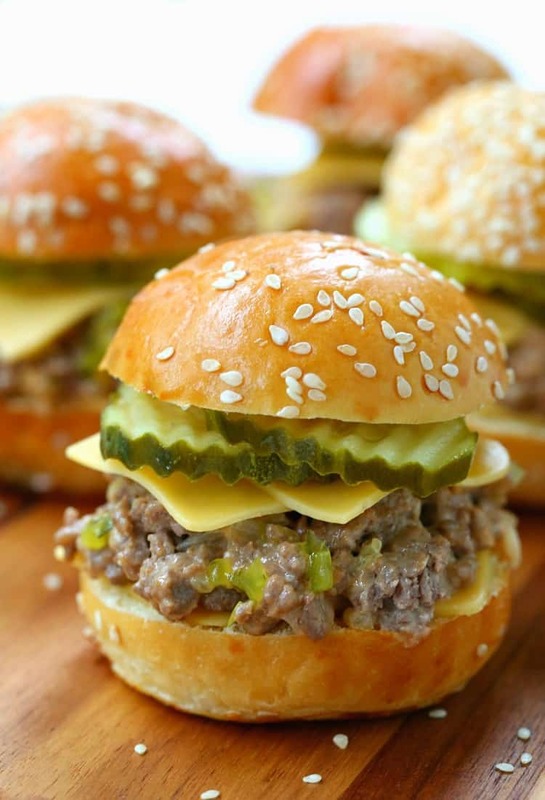 Sloppy Joe Mini Mac Sliders are calling my name! 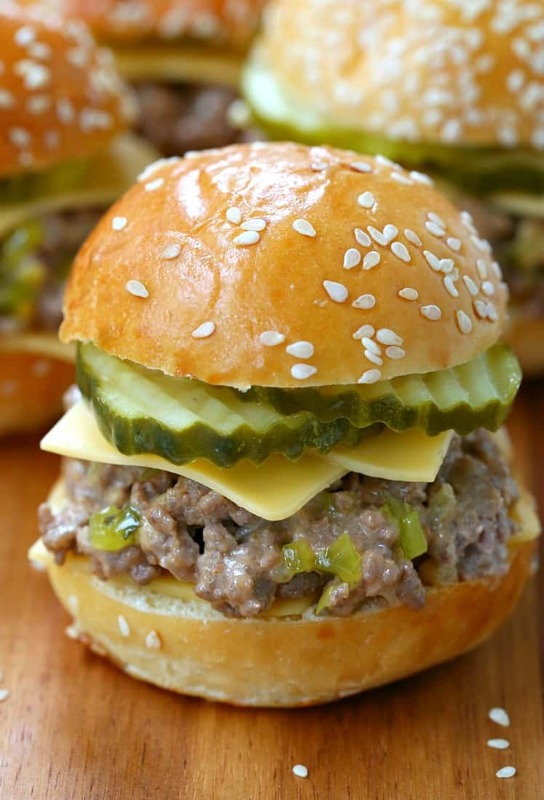 Any Big Mac fan out there needs to try this beef slider recipe for a fun dinner at home! 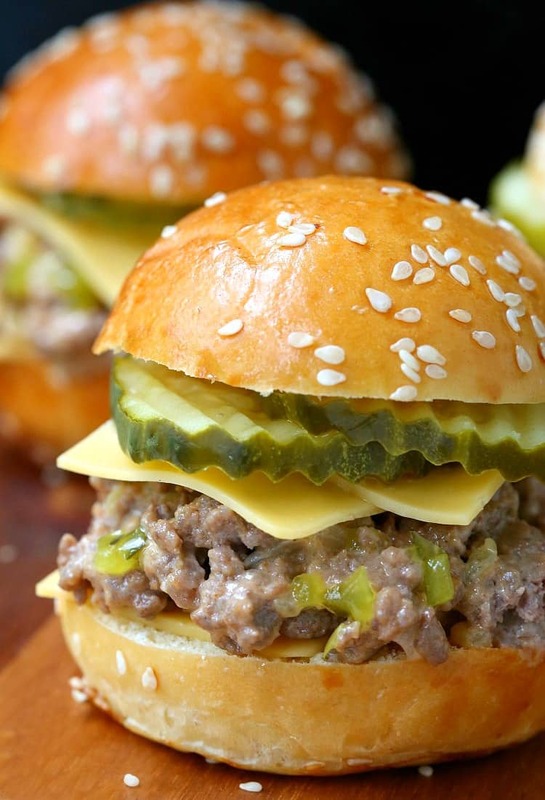 I’m going to go out there and say that these Sloppy Joe Mini Mac Sliders are a home run. Yep, an over the fence, out of the park home run. Because that’s how flipping amazing these sliders are. Truly amazing. And you know I wouldn’t lie to you guys, take me word that you will be making these all the time. For dinner, for parties for potlucks or maybe even just a snack. These Sloppy Joe Mini Mac Sliders taste just like your favorite fast food sandwich – only better. Here’s a little hint for you too…the special sauce isn’t just added on top…it’s mixed right in with the beef. 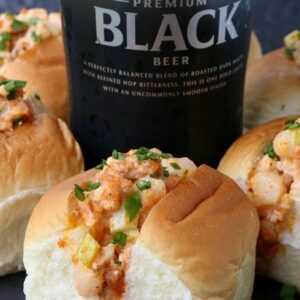 We love making sliders for fun dinners or parties, these French Dip Party Sliders are one of our favorites! But now this beef slider recipe is climbing to the top. So instead of making a burger patty, I turned this dish into a loose meat sandwich similar to a sloppy joe. Mixing that special sauce right in with the onions and beef to make these sliders super creamy and super delicious. Can You Make These Sliders Ahead of Time? The answer is mostly, yes. You can make the filling ahead of time, but I do recommend doing it a certain way. Make the beef filling first, them the sauce separately. Then right before serving heat up the beef filling and mix the sauce in with it while it’s warm. That way these sliders are the best tasting, creamiest versions of themselves. And since it only takes about 15 minutes from start to finish, I’m thinking you’ve got this 100 percent. 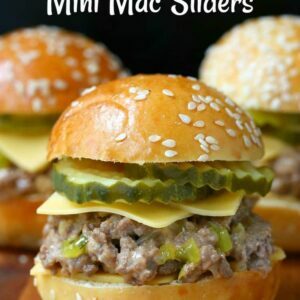 These Sloppy Joe Mini Mac Sliders are so crazy tasty there going to be gone from the appetizer table in seconds. 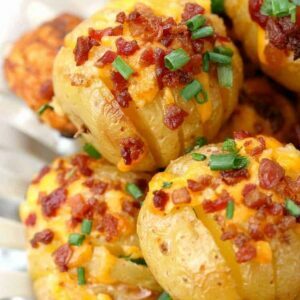 Oh, just making these for dinner? Well watch your family come running. 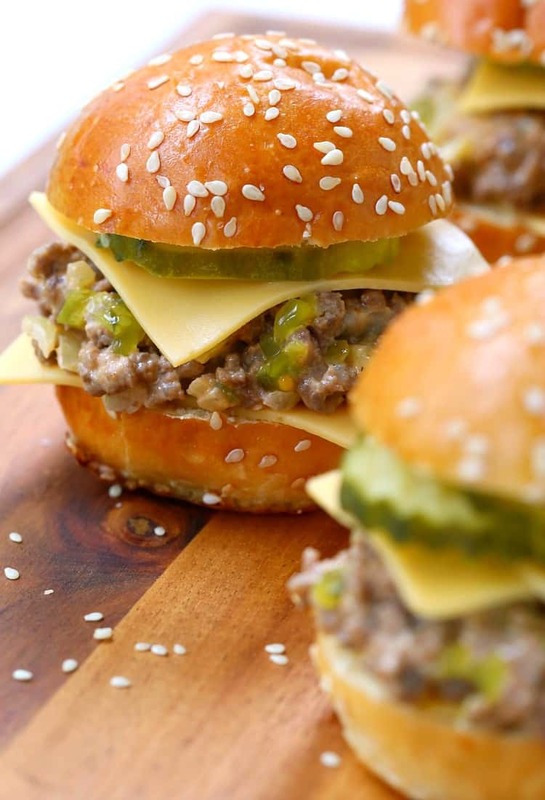 So next time you get a Big Mac attack, try one of these Sloppy Joe Mini Mac Sliders instead. It’ll satisfy that fast food craving easily. Make sure you stack up the cheese and pickles accordingly – don’t leave off the toppings on this one! 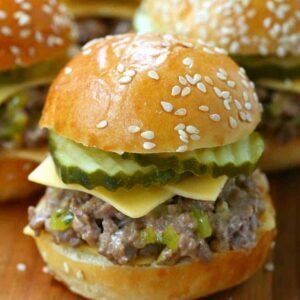 These Sloppy Joe Mini Mac Sliders have all the flavors of your favorite fast food sandwich made at home! Add the beef, breaking up with a spoon and cooking until no longer pink, about 5 minutes. Drain off any grease from the beef and return to the skillet. Add the onions, stirring into the beef and cook for another 5 minutes until the onions have softened. While the onions are cooking, mix together the salt, garlic powder, mayonnaise, ketchup, pickle relish and vinegar in a bowl. Turn the heat off and pour the sauce over the beef, stirring to combine. 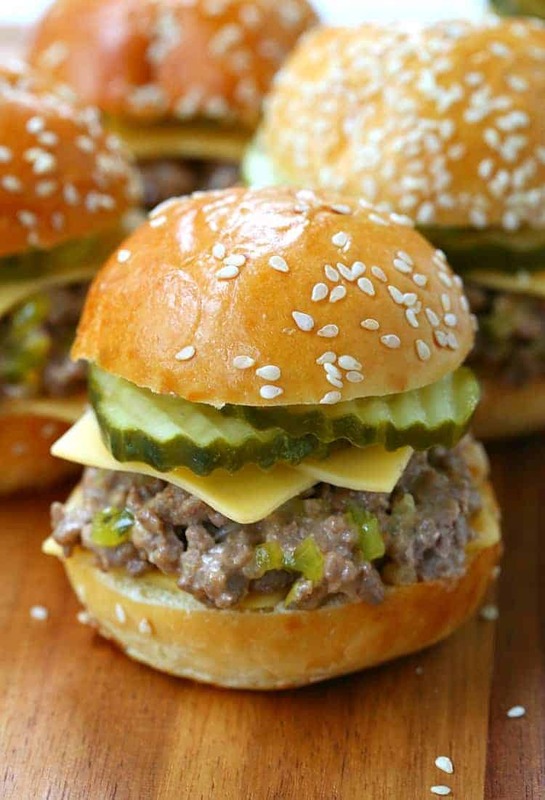 Serve on slider buns with a half of slice of cheese each and 2 pickles per slider. You’ve convinced me, sounds great! 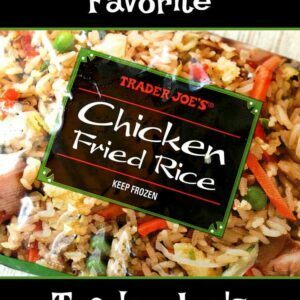 They are SO good – let me know when you try them!